JEFFERSON- Lots of food, beverages, the chance to win some guns, along with a cash were all motivating factors in bringing out locals and visitors to this year’s Andover Volunteer Fire Department gun raffle and sportsman’s festival on Saturday, Sept. 8 within Ashtabula County Fair Grounds of Jefferson. (From Sept. 14 edition). According to Sales/Advertising Coordinator David Miller attendees this year’s event offered attendees the opportunity to win multiple prizes and cash worth $100,000, as well as a final grand prize of $10,000 at the end of the event. For those unaware, Miller said any gun winners (as done in the past) will be required to take their ticket to the gun shop that donated towards the cause in order to obtain it, if are absent will be mailed the ticket, or if out of state will have their ticket mailed to the proper dealer in order to have a background check arranged. Of some of the attendees hoping to take something home with them that day included Geneva residents Steve and Randy Ozbolt, Chardon resident Jim Harrington, Mentor native John Sebulski, plus William Luce of Andover. Luce, who who was working with Tina Giddings and others on behalf of 4-H Country Bumpkins were also proud to support the fundraiser event. “We come almost every year,” said Luce. Several others seemed pleased with the weather and results that day as well, including Christina Pizzi of Painesville who attended with her co-worker Dana Rini of Cuyahoga Heights, along with Jerry Larusch of Jefferson. “I’m just here for the fun,” said Rini. Greg Tate of Hubbard, Brain Luce of Jefferson and Clark George of Bristolville expressed their support and eagerness to win as well. 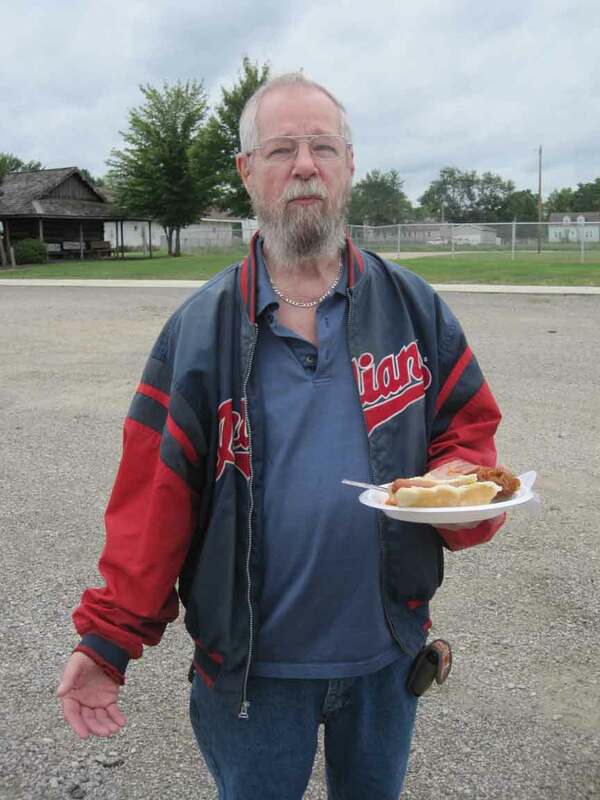 Pictured: Jefferson resident Jerry Larusch enjoying a hot dog and some side dishes while attending this year’s gun raffle and sportsman’s festival through Andover Volunteer Fire Department.